A book is lots of wonderful things. It holds stories inside--sometimes true, sometimes not so true. Books are great to read in bed (but not when they're too heavy). They can be big, small, with pictures or without. Books can sometimes be chewed by babies (and dogs, too, but not usually). They are found in libraries and school and on shelves--and you can go anywhere inside a book. If you want a horse (*Ella, are you listening? ), you don't need to buy one--you can just read a book about them! A Book is a Book is nothing short of lovely. Its voice is so sweetly lingering and so much fun to wander through--I simply adore author Bornholdt's use of language and the way she speaks so openly and warmly to children. 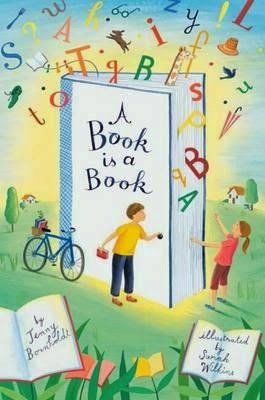 Small format (about the size of a junior fiction novel), with clean white pages and truly divine, meandering illustrations, A Book is a Book is also a joy to look at. It even comes with its own bookmark. Sharing the joys of books with children is super easy, but it's made even lovelier with this gorgeous little tome with feel-good messaging that turns into smiles. A must-have for lovers of great illustration, too. *Ella is my daughter. And yes, she wants a horse.